Here's a great trivia quiz on the life and career of Douglas MacArthur, US Army General Officer on active duty from 1899 through 1951. 1. 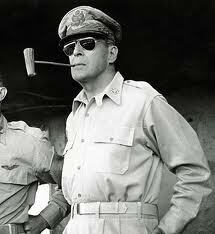 Both Douglas MacArthur and his father were the first father/son to both receive the same military decoration. What was it? 2. Where did MacArthur rank in his West Point graduation class of 1903? D. 93 of 93 - Anchor Man! 3. What was MacArthur's father doing when the younger MacArthur graduated from West Point? 4. Why was the then-Lieutenant MacArthur transferred from the Philippines? A. He was caught in bed with his Commanding Officer's wife. B. He was beaten to near death by bandits. C. He contracted malaria and dhobi itch. D. His mother became ill.
5. Which President requested MacArthur as an aide to assist in White House functions as MacArthur was attending engineering School in Washington, DC? 6. In 1914 in Veracruz, Mexico, MacArthur was scouting for locomotives to support his unit, and was beset upon by bandits. How many did MacArthur shoot? A. Seven, and a horse. B. Six, and a camel. C. Four, and a vicious dog. D. Three, and an albino mule. 7. In 1917, MacArthur was sent to Europe as the Chief of Staff of the 42nd Division. What was the nickname of that illustrious troop? 8. In 1918, to what rank was MacArthur promoted in 1918, making him the youngest in the AEF? 9. MacArthur accepted a posting as Superintendent of the U.S. Military Academy. His biggest battles in this post were those opposing what? A. The US President - Wilson - against recruiting black cadets and women. B. Against Congress - to prevent the loss of funding. C. Against the US Army - improving curriculum and lengthening the term of the school. D. Against the US Marine Corps, that was trying to take over the US Army. 10. In 1932, MacArthur led the US Army against US veterans encamped around Washington, DC. What were the protesters called? D. Veterans against the War.